Any beginner musician knows that booking shows can be extremely tough. Venues want to schedule acts with a following so they'll sell tickets, but one of the best ways to build a fanbase in the first place is to play live. It's a conundrum that all musicians have faced, and unfortunately, there's no easy way around it. One thing that can help solve this issue is playing open mic nights. They allow almost anybody to perform, and if you're trying to make it in New York City, you're in luck, as there are plenty of options to get up on stage. Some cost money, some are at less-than-perfect times, but if you're serious about putting your music in front of as many people as possible, you may want to consider these opportunities. Prohibition is what we wish every New York City bar could be: extremely cool, but not pretentious at all. It's exceptionally rare to find those two qualities together, so that makes this Upper West Side haunt a gem. The bar has an open mic night every Monday from 9:00 p.m. until midnight, and while that may not be the ideal time to gain a massive new following, it never hurts to play to any kind of crowd. One of the longest-running open mics in the city, Pete’s Candy Store has shown itself to be a true patron of underground artists. The weekly chance for fledgling musicians to show what they've got has been going for almost 15 years now, and it seems like the venue will continue the event as long as talented artists keep showing up. The open mic night is specifically for those who are creating original music and who want to test it in front of an audience, so no covers! This is one of the few open mics in NYC that actually costs money, both for attendees and those wanting to perform. It's not terribly expensive – a ticket for one audience member or a solo act looking to play is just $7, and a band with three members is $15 – but that may still price this opportunity out of some musicians' budgets. Called "The Inspired Word," the event takes place every Monday night. While it may be more focused on burgeoning poets (hence the name), this cafe does have space for musicians as well. If you want to share a poem (perhaps your lyrics in spoken form? ), there are three times when you can do so: the first Wednesday of the month, and the third and last Saturday of each month. If you want to pick up a guitar and play for an intimate crowd, show up on the first Wednesday, and be prepared to see all different kinds of performances. The Village Underground claims that its open mic night is the world's longest-running. While that may be tough to prove, it's well known that the venue has hosted singers that have gone on to change music forever, such as Mariah Carey, Chaka Khan, and Prince over the years. Host Ron Grant introduces the local talent that take to the stage every Sunday night. If you want to play, be prepared to pay: a slot will cost you $15. Only once a month, Open Stage (it’s not called open mic because – as the venue's website points out – there are no microphones) is a chance for anybody with a talent to share it with a mainly collegiate audience. Sign-ups are first-come-first-serve, so make sure to get there by 7:00 p.m. The show goes almost all night, and organizers fit in as many acts as possible, giving each performer around 10 minutes. Playing at a college could be a great way to expose new audiences to your music, and it may lead to future performances at the school if they like you. 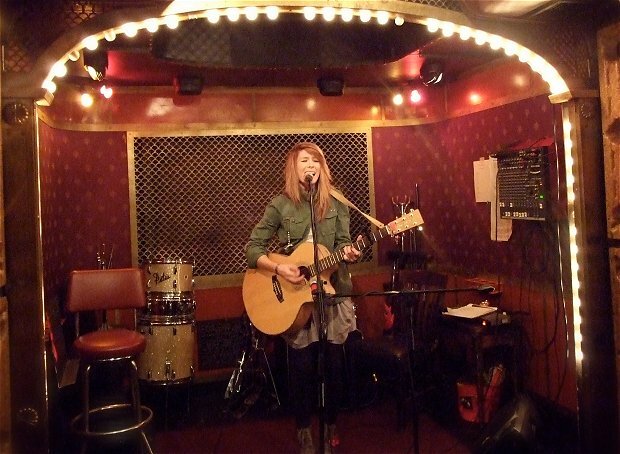 Learn how to maximize your open mic time and leave the night with new fans!